The Turk's Head was a bonus pub for me that I'd not planned on visiting. Just a few doors up from the more famous Admiral Benbow, the Turk's Head is actually older and a little less pretentious. It was very busy on my Saturday evening visit, with all food tables occupied and people spilling outside. I managed to grab a stool at the bar. Ales were Sharp's Doom Bar, Skinner's Hops n Honey & Betty Stogs & Timothy Taylor Landlord. Cider was Old Rosie. Friendly service. A great place to drink and eat. The staff are very friendly and helpful. Food is spot on and the beer is top notch. 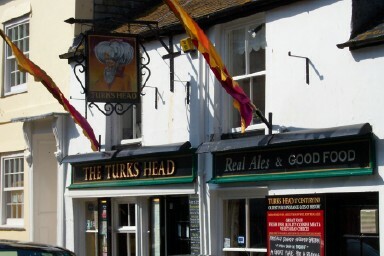 Worth trying a pint of Turk's Head Ale brewed by Sharps in Cornwall, so much better than the now doomed Doom Bar which I believe is brewed in Burton upon Trent. Allegedly this is the lodest pub in Penzance, well managed, possibly a bias to the "dry" side over "wet" sales. Four ales on from Skinners and St.Austell in excellent condition, I would prefer to have seen an ale from a Cornish micro Brewery ( there are more than enough to choose from) such as Chough Brewery who are brewing really fantastic beer on the Lizard peninsula. A Cask Marque accreditation in the window,as usual a good pointer. Called in last Saturday, quite late on, the lady who served our ale should be congratulated for pulling a perfect pint, however she went home before we were able to thank her properly. Although the Landlord was prepaing to close up, he spent a good 15 minutes talking shop with us. Decent beer, but as we were scouting for places to eat rather than actually buying food, the landlady(?) was "terse" :/ There's better places to eat in Penzance so didn't go back.